Before you head for the shore this summer, consider packing your beach bag with gear that’s both stylish and eco-friendly. One-piece bathing suit: A good full-coverage maillot swimsuit is always tough to find. The ideal version is one that is comfortable, flatters figures and is made from recycled and durable materials. Eco Swim by Aqua Green (around $100, ecoswim.com) is a fourth-generation American-made swimsuit line that utilizes sustainable materials. They are available at Macy’s, Dillard’s and Nordstrom, so you can try them on before buying. Bikini: If you prefer bikinis, check out Ambika’s hand-crocheted versions ($125-$155 per piece, ambikaboutique.com), which are meant to be worn in the water and look great under sundresses, too. Made in upstate New York, the bikinis will adjust to your shape after they get wet. Sunglasses: Not only are they usually made from nonrenewable, fossil fuel-based plastic, but regular shades rarely get recycled. 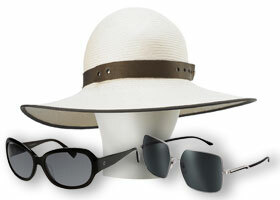 To get the same look with less impact, check out shades from Eco Eyewear ($160-$175, eco-optics.com), which are made from a mix of 95% recycled materials (verified by independent certification). The company also plants a tree for every pair of glasses sold. High-fashion, low-impact designer Stella McCartney ($225-$250, stellamccartney.com) makes bio-based sunglasses, if you prefer the superglam look and have extra bucks to burn. Hat: A good wide-brimmed hat does double-duty, keeping sun from your face, neck and shoulders and hiding any hair drama that might be happening after a dip in the salt water. Those made from natural materials tend to be lightweight, fast drying and breathable, so look for hats made from woven grasses like straw or hemp. The Voyage Sun Hat from Tracy Watts ($225, tracywatts.com) is handmade in Brooklyn from straw and is foldable for easy packing. It’s simple and stylish enough for on-the-beach and on-the-town wear. 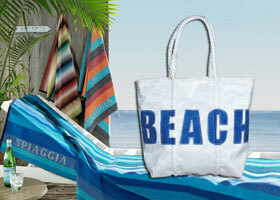 Beach bags: Necessary to haul the essentials, beach bags are not only incredibly useful for days at the shore, but for carting groceries and gear year-round. Maine-based Sea Bags makes gorgeously graphic large totes from recycled sailboat sails ($130-$180, seabags.com) that will hold sports gear, a family’s worth of towels or a picnic’s worth of food and drinks. The company also donates to local charities. 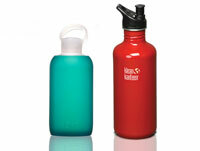 Water bottle: For water on the go, look for BPA-free plastic, stainless steel or protected glass. Bkr makes cool-looking thick glass containers ($28, mybkr.com) with a silicone sleeve (you choose from a variety of candy colors) that are tough to break. Kleen Kanteen’s stainless steel bottles ($25.95-$27.95/40 oz., kleankanteen.com) last forever and somehow manage to always make water taste cool. Breathable Footwear: Flip-flops from Okabashi ($16.99-$19.99, okabashi.com) are ergonomic, brightly colored and perfect for watery adventures. They are also made with a “lean manufacturing” process that conserves energy and utilizes landfill-bound materials and can be returned to the company for recycling when they eventually get worn out or broken. 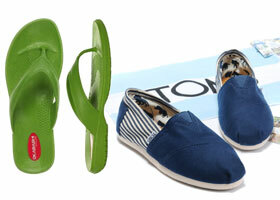 The “one for one” program from Toms ($54-$68/men’s and women’s classics, toms.com) ensures that for every pair you buy, a child in need of shoes will get a pair. And the philanthropically minded company has some cute new styles for summer in quick-dry cotton canvas. STARRE VARTAN is the founder and editor-in-chief of eco-chick.com and author of The Eco-Chick Guide to Life (St. Martin’s Press). 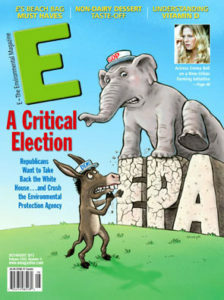 She is also editor-at-large for Coco Eco Magazine.